Any consumer who’s thinking about purchasing a new compact SUV should strongly consider the 2019 Jeep Compass. With the Compass, you’ll have everything you need to enjoy an outstanding driving experience, including rugged engine power and reliable performance features. When you learn some basic information about the latest version of the Jeep Compass, you’ll want to get behind the wheel of this model as soon as possible. Four trim-level options are available for consumers who invest in the new Compass: the Sport, Latitude, Limited, and Trailhawk. Whether you’re seeking unstoppable performance or eye-catching style, there’s a trim level that will meet your needs. 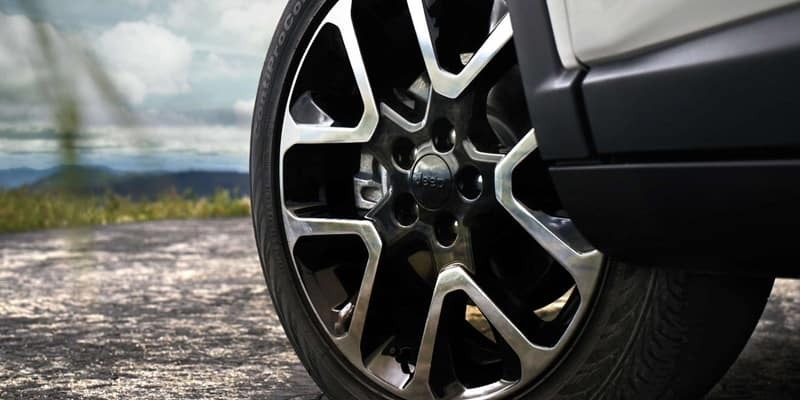 The best exterior feature on the Sport trim is its 16-inch silver-painted steel wheels. The Latitude upgrades the wheels to 17-inch polished aluminum and adds a dual-pane sunroof. The Limited trim level is the best choice for most consumers, thanks to its signature exterior trim and larger wheels. 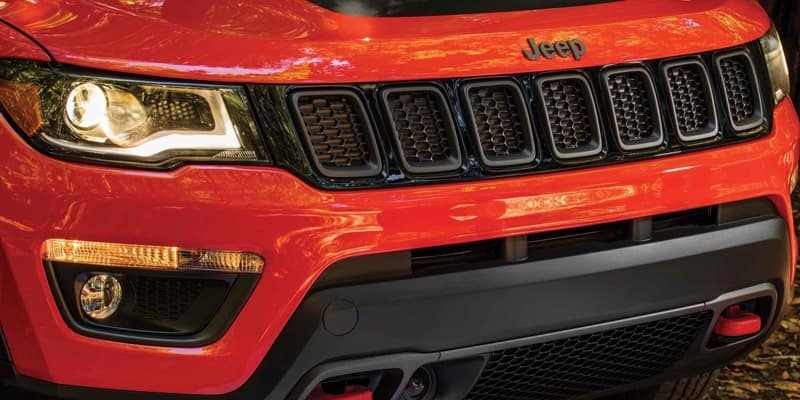 If you’re an adventurous motorist, however, you’ll want to choose the Trailhawk, which is designed for off-road driving, thanks to special tires, skid plates, and a standard four-wheel-drive system. 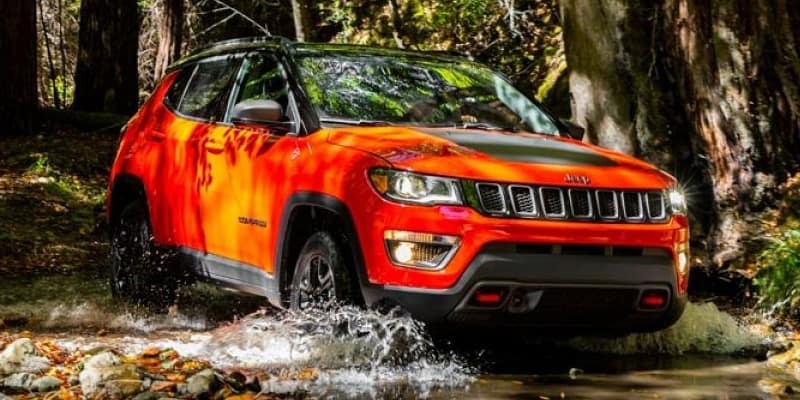 Jeep vehicles are known for their dependable engine performance, and the Compass more than fulfills this legacy with its 2.4-liter Tigershark engine. With this engine under your hood, you’ll have performance ratings of 175 pound-feet of torque and 180 horsepower. While the 2019 Jeep Compass offers an array of excellent features, the primary reason consumers love this model is its versatile performance. Suitable for both highway trips and off-road excursions, the Compass will satisfy all your transportation needs. When the road becomes bumpy or slick, you’ll be glad to have the Jeep Active Drive four-wheel-drive system that allows you to switch to four-wheel drive whenever you want or need. And thanks to the Selec-Terrain system, you’ll be able to maintain your traction on snow, sand, and mud. The 2019 Compass also provides impressive towing ability. Add the right towing equipment to your vehicle, and you’ll be able to haul up to 2,000 pounds. The inside of the Jeep Compass is just as impressive as its outside, providing irresistible features that guarantee a pleasurable ride. 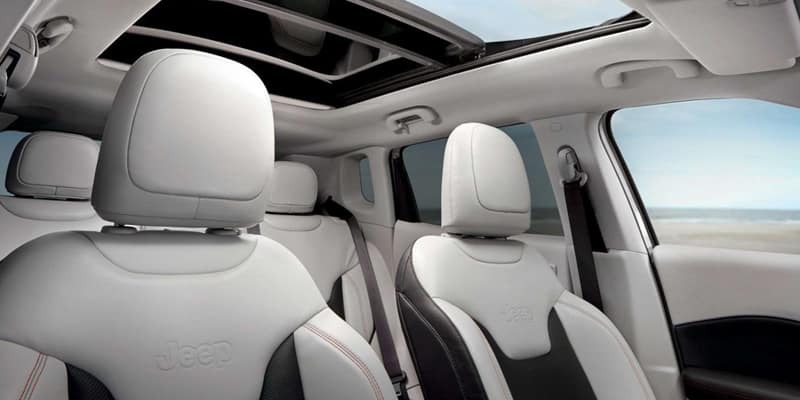 Discerning consumers, for example, can choose the available leather seating for a high-end look and feel. To guarantee your comfort, the Compass is available with features like heated front seats and dual-zone automatic climate control. If you need extra storage space, you can fold down the rear seats and access 59.8 cubic feet of room. Several Uconnect infotainment systems are available, with features such as satellite radio and turn-by-turn navigation. You can also equip your vehicle with a BeatsAudio sound system for first-rate sound quality. Feeling safe is important when you go for a drive, and with the 2019 Jeep Compass, you’ll have complete peace of mind, thanks to a mix of passive and active features. The frame of the Compass is made with high-strength steel that can hold up under tough collisions, and the advanced air-bag system works to limit the danger of these wrecks. Active safety features, such as a lane-departure alert with lane-keep assist and a collision warning system, will give you added protection. Now that you’ve gotten acquainted with the 2019 Jeep Compass, discover it for yourself. Just schedule a test drive. * 2019 ** Jeep * * Compass * * Latitude * This 2019 Jeep Compass Latitude is a great option for folks looking for top features like a push button start, backup camera, Bluetooth, braking assist, dual climate control, hill start assist, stability control, traction control, anti-lock brakes, and dual airbags. Complete with a stunning billet silver metall exterior and a black interior, this vehicle is in high demand. Want a SUV 4X4 you can rely on? This one has a crash test rating of 4 out of 5 stars! Good cars sell fast! Give us a call and schedule an appointment today! Call Josh Tharp at 317-839-6554 for more information or to start your EAZY DEAL at Westgate By submitting an inquiry on this vehicle you are agreeing and consenting to our dealership contacting you by telephone, text messaging or other means concerning your inquiry, potential vehicle sale or promotional offerings by our dealership and other information. By participating, you consent to receive recurring text messages sent through an automatic telephone dialing system. Message and data rates m. Contact Information: Westgate Chrysler, 2695 East Main Street, Plainfield, IN, 46168, Phone: (317) 839-6554, E-mail: jtharp@westgateauto.com. * 2019 ** Jeep * * Compass * * Altitude * With top features including the push button start, backup camera, Bluetooth, braking assist, dual climate control, hill start assist, stability control, traction control, anti-lock brakes, and dual airbags, this 2019 Jeep Compass Altitude is a great decision. Drivers love the dazzling red exterior with a black interior. With an unbeatable 4-star crash test rating, this SUV 4X4 puts safety first. Make your move before it's too late schedule a test drive today! Call Josh Tharp at 317-839-6554 for more information or to start your EAZY DEAL at Westgate By submitting an inquiry on this vehicle you are agreeing and consenting to our dealership contacting you by telephone, text messaging or other means concerning your inquiry, potential vehicle sale or promotional offerings by our dealership and other information. By participating, you consent to receive recurring text messages sent through an automatic telephone dialing system. Message and data rates m. Contact Information: Westgate Chrysler, 2695 East Main Street, Plainfield, IN, 46168, Phone: (317) 839-6554, E-mail: jtharp@westgateauto.com. * 2019 ** Jeep * * Compass * * Altitude * It doesn't get much better than this 2019 Jeep Compass Altitude, which boasts a push button start, backup camera, Bluetooth, braking assist, dual climate control, hill start assist, stability control, traction control, anti-lock brakes, and dual airbags. Flaunting a charming diamond black exterior and a black interior, this car is a sight to see from the inside out. With a 4-star crash test rating, this is one of the safest vehicles you can buy. Don't wait on this one. Schedule a test drive today! Call Josh Tharp at 317-839-6554 for more information or to start your EAZY DEAL at Westgate By submitting an inquiry on this vehicle you are agreeing and consenting to our dealership contacting you by telephone, text messaging or other means concerning your inquiry, potential vehicle sale or promotional offerings by our dealership and other information. By participating, you consent to receive recurring text messages sent through an automatic telephone dialing system. Message and data rates m. Contact Information: Westgate Chrysler, 2695 East Main Street, Plainfield, IN, 46168, Phone: (317) 839-6554, E-mail: jtharp@westgateauto.com. * 2019 ** Jeep * * Compass * * Limited * Outfitted with a push button start, backup camera, Bluetooth, braking assist, dual climate control, hill start assist, stability control, traction control, anti-lock brakes, and dual airbags, this 2019 Jeep Compass Limited is a true steal. Exhibiting a charming red line exterior and a black interior, this vehicle won't be on the market for long. Don't skimp on safety. Rest easy with a 4 out of 5 star crash test rating. Don't wait on this one. Schedule a test drive today! Call Josh Tharp at 317-839-6554 for more information or to start your EAZY DEAL at Westgate By submitting an inquiry on this vehicle you are agreeing and consenting to our dealership contacting you by telephone, text messaging or other means concerning your inquiry, potential vehicle sale or promotional offerings by our dealership and other information. By participating, you consent to receive recurring text messages sent through an automatic telephone dialing system. Message and data rates m. Contact Information: Westgate Chrysler, 2695 East Main Street, Plainfield, IN, 46168, Phone: (317) 839-6554, E-mail: jtharp@westgateauto.com. * 2019 ** Jeep * * Compass * * Trailhawk * This reliable 2019 Jeep Compass Trailhawk comes with a variety of features, including push button start, backup camera, Bluetooth, braking assist, dual climate control, hill start assist, stability control, traction control, anti-lock brakes, and dual airbags. Flaunting a suave red line exterior and a black interior. Stay safe with this SUV 4X4's 4 out of 5 star crash test rating. Interested? Don't let it slip away! Call today for a test drive. Call Josh Tharp at 317-839-6554 for more information or to start your EAZY DEAL at Westgate By submitting an inquiry on this vehicle you are agreeing and consenting to our dealership contacting you by telephone, text messaging or other means concerning your inquiry, potential vehicle sale or promotional offerings by our dealership and other information. By participating, you consent to receive recurring text messages sent through an automatic telephone dialing system. Message and data rates m. Contact Information: Westgate Chrysler, 2695 East Main Street, Plainfield, IN, 46168, Phone: (317) 839-6554, E-mail: jtharp@westgateauto.com. * 2019 ** Jeep * * Compass * * Trailhawk * Make sure to get your hands on this 2019 Jeep Compass Trailhawk with a push button start, backup camera, Bluetooth, braking assist, dual climate control, hill start assist, stability control, traction control, anti-lock brakes, and dual airbags before it's too late! Rocking a timeless diamond black exterior and a black interior, this car is a sight to see from the inside out. With a 4-star crash test rating, this is one of the safest vehicles you can buy. View this beauty and our entire inventory today! Call for more details. Call Josh Tharp at 317-839-6554 for more information or to start your EAZY DEAL at Westgate By submitting an inquiry on this vehicle you are agreeing and consenting to our dealership contacting you by telephone, text messaging or other means concerning your inquiry, potential vehicle sale or promotional offerings by our dealership and other information. By participating, you consent to receive recurring text messages sent through an automatic telephone dialing system. Message and data rates m. Contact Information: Westgate Chrysler, 2695 East Main Street, Plainfield, IN, 46168, Phone: (317) 839-6554, E-mail: jtharp@westgateauto.com. * 2019 ** Jeep * * Compass * * Limited * You'll love getting behind the wheel of this 2019 Jeep Compass Limited, which is complete with amenities such as a push button start, remote starter, backup camera, Bluetooth, braking assist, dual climate control, hill start assist, stability control, traction control, and anti-lock brakes. Rocking a charming gray clearcoat exterior and a black interior, this car is a great pick. You can trust this SUV 4X4 because it has a crash test rating of 4 out of 5 stars! Call today to schedule your test drive! Call Josh Tharp at 317-839-6554 for more information or to start your EAZY DEAL at Westgate By submitting an inquiry on this vehicle you are agreeing and consenting to our dealership contacting you by telephone, text messaging or other means concerning your inquiry, potential vehicle sale or promotional offerings by our dealership and other information. By participating, you consent to receive recurring text messages sent through an automatic telephone dialing system. Message and data rates m. Contact Information: Westgate Chrysler, 2695 East Main Street, Plainfield, IN, 46168, Phone: (317) 839-6554, E-mail: jtharp@westgateauto.com. * 2019 ** Jeep * * Compass * * Limited * You'll love the look and feel of this 2019 Jeep Compass Limited, which features a push button start, remote starter, backup camera, Bluetooth, braking assist, dual climate control, hill start assist, stability control, traction control, and anti-lock brakes. With a charming red line exterior and a black interior, this vehicle is a top pick. With a crash test rating of 4 out of 5 stars, everyone can feel secure. Call and schedule your test drive today! Call Josh Tharp at 317-839-6554 for more information or to start your EAZY DEAL at Westgate By submitting an inquiry on this vehicle you are agreeing and consenting to our dealership contacting you by telephone, text messaging or other means concerning your inquiry, potential vehicle sale or promotional offerings by our dealership and other information. By participating, you consent to receive recurring text messages sent through an automatic telephone dialing system. Message and data rates m. Contact Information: Westgate Chrysler, 2695 East Main Street, Plainfield, IN, 46168, Phone: (317) 839-6554, E-mail: jtharp@westgateauto.com. * 2019 ** Jeep * * Compass * * Limited * With such great unique features like a push button start, remote starter, backup camera, Bluetooth, braking assist, dual climate control, hill start assist, stability control, traction control, and anti-lock brakes, you'll be excited to take this 2019 Jeep Compass Limited for a ride. Flaunting a suave olive green exterior and a black interior, this car is a sight to see from the inside out. This one's a keeper. It has a crash test safety rating of 4 out of 5 stars. Don't wait until it is too late! Call today to schedule an appointment. Call Josh Tharp at 317-839-6554 for more information or to start your EAZY DEAL at Westgate By submitting an inquiry on this vehicle you are agreeing and consenting to our dealership contacting you by telephone, text messaging or other means concerning your inquiry, potential vehicle sale or promotional offerings by our dealership and other information. By participating, you consent to receive recurring text messages sent through an automatic telephone dialing system. Message and data rates m. Contact Information: Westgate Chrysler, 2695 East Main Street, Plainfield, IN, 46168, Phone: (317) 839-6554, E-mail: jtharp@westgateauto.com. * 2019 ** Jeep * * Compass * * Limited * Don't miss out on this 2019 Jeep Compass Limited! It comes with a push button start, remote starter, backup camera, Bluetooth, braking assist, dual climate control, hill start assist, stability control, traction control, and anti-lock brakes for an even better ride. Complete with a classic diamond black exterior and a black interior, this vehicle is in high demand. Stay safe with this SUV 4X4's 4 out of 5 star crash test rating. Interested? Call today and schedule a test drive! Call Josh Tharp at 317-839-6554 for more information or to start your EAZY DEAL at Westgate By submitting an inquiry on this vehicle you are agreeing and consenting to our dealership contacting you by telephone, text messaging or other means concerning your inquiry, potential vehicle sale or promotional offerings by our dealership and other information. By participating, you consent to receive recurring text messages sent through an automatic telephone dialing system. Message and data rates m. Contact Information: Westgate Chrysler, 2695 East Main Street, Plainfield, IN, 46168, Phone: (317) 839-6554, E-mail: jtharp@westgateauto.com. * 2019 ** Jeep * * Compass * * Limited * It doesn't get much better than this 2019 Jeep Compass Limited, which boasts a push button start, remote starter, backup camera, Bluetooth, braking assist, dual climate control, hill start assist, stability control, traction control, and anti-lock brakes. With a classic billet silver metall exterior and a black interior, this vehicle is a top pick. Drive away with an impeccable 4-star crash test rating and prepare yourself for any situation. This is the vehicle for you! Give us a call today and don't let it slip away! Call Josh Tharp at 317-839-6554 for more information or to start your EAZY DEAL at Westgate By submitting an inquiry on this vehicle you are agreeing and consenting to our dealership contacting you by telephone, text messaging or other means concerning your inquiry, potential vehicle sale or promotional offerings by our dealership and other information. By participating, you consent to receive recurring text messages sent through an automatic telephone dialing system. Message and data rates m. Contact Information: Westgate Chrysler, 2695 East Main Street, Plainfield, IN, 46168, Phone: (317) 839-6554, E-mail: jtharp@westgateauto.com. * 2019 ** Jeep * * Compass * * Limited * This 2019 Jeep Compass Limited includes a push button start, remote starter, backup camera, Bluetooth, braking assist, dual climate control, hill start assist, stability control, traction control, and anti-lock brakes and is a car that deserves some serious attention. Drivers love the gorgeous gray clearcoat exterior with a black interior. This SUV 4X4 is one of the safest you could buy. It earned a crash test rating of 4 out of 5 stars. Interested? Don't let it slip away! Call today for a test drive. Call Josh Tharp at 317-839-6554 for more information or to start your EAZY DEAL at Westgate By submitting an inquiry on this vehicle you are agreeing and consenting to our dealership contacting you by telephone, text messaging or other means concerning your inquiry, potential vehicle sale or promotional offerings by our dealership and other information. By participating, you consent to receive recurring text messages sent through an automatic telephone dialing system. Message and data rates m. Contact Information: Westgate Chrysler, 2695 East Main Street, Plainfield, IN, 46168, Phone: (317) 839-6554, E-mail: jtharp@westgateauto.com. 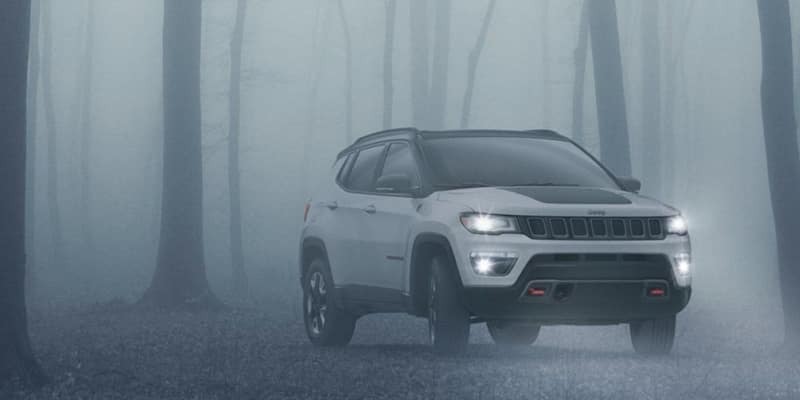 * 2019 ** Jeep * * Compass * * Limited * With such great unique features like a push button start, backup camera, Bluetooth, braking assist, dual climate control, hill start assist, stability control, traction control, anti-lock brakes, and dual airbags, you'll be excited to take this 2019 Jeep Compass Limited for a ride. Drivers love the timeless red exterior with a black interior. Don't skimp on safety. Rest easy with a 4 out of 5 star crash test rating. Call today to schedule your test drive! Call Josh Tharp at 317-839-6554 for more information or to start your EAZY DEAL at Westgate By submitting an inquiry on this vehicle you are agreeing and consenting to our dealership contacting you by telephone, text messaging or other means concerning your inquiry, potential vehicle sale or promotional offerings by our dealership and other information. By participating, you consent to receive recurring text messages sent through an automatic telephone dialing system. Message and data rates m. Contact Information: Westgate Chrysler, 2695 East Main Street, Plainfield, IN, 46168, Phone: (317) 839-6554, E-mail: jtharp@westgateauto.com.